Set on a remote island in the south of Chile you'll find what may be the countries coolest accommodation offering. Tierra Chiloé is an all-inclusive retreat for the adventurous, mixing absolute luxury and gourmet local food with a unique collection of activities and excursions. 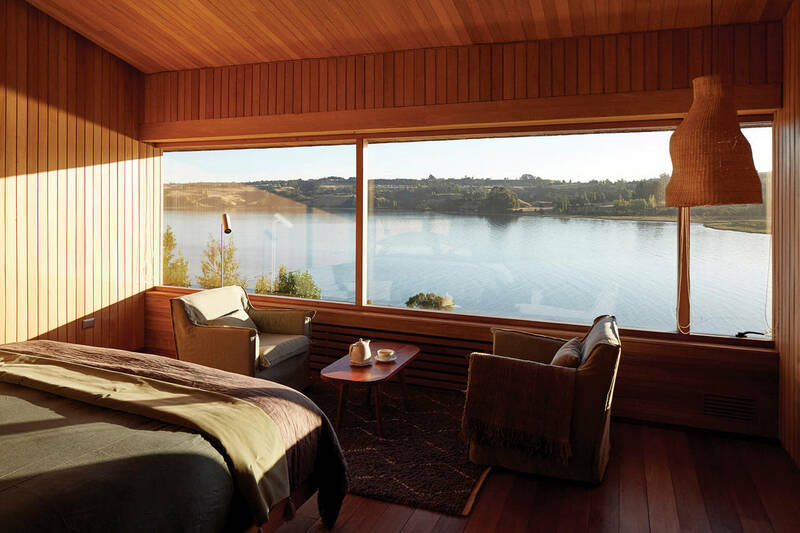 Tierra Chiloé is a reimagined hotel/lodge that is now going through its second life. A recent renovation, an ownership change and the naturally gorgeous surroundings has allowed the lodge to double its size and bring a larger mix of amenities and activities on site that you can't find anywhere else. Set on stilts, with a wooden-tiled façade, this boutique hideaway reflects the traditional architecture of the Chiloé region and is designed so that each of the 24 guest rooms, as well as the beautiful commons areas, make the most of the spectacular sea views. Guest rooms are suspended above the hilly site on the upper floor, while common areas underneath have lightwells and ceilings that angle upwards, all to amplify the natural light that enters. All the rooms, no matter the size come with views of the ocean. There is a range of sizes available with the new luxury suites offering the most space and comfort, albeit with a much larger price tag. The bathrooms in all the rooms also have picture windows so you can enjoy the view as you relax in the free-standing bath. There are no televisions here – the idea is to relax and just enjoy the wild surroundings. All food and drinks are included in your stay and are served in a comfortable dining room which sits a half level above the living area, with panoramic views of the property and the sea beyond. The lodge offers an amazing range of excursions that you can partake in, which include horse riding, trekking, kayaking and cultural visits to the island’s towns and Unceso-listed wooden churches. Tierra Chiloé not only has its own horses that roam the property but also its own traditionally-built boat – Williche – which happily chugs guests to visit the other smaller islands dotted around the Chiloé coast. The lodge also has a small spa on site with a sauna and hot tub offers the perfect place to relax after a day of excursions. The season for Tierra Chiloé only runs from September to May (summer in the Southern Hemisphere). Which means a stay is expensive, but remember, the price includes all food, drinks and excursions and makes for a truly unique island escape. The lodge is located on the east coast of Chiloé Island, also known as Isla Grande de Chiloé, in Chile's Lake District. The lodge sits on top of a hill and looks across a grassy meadow to Pullao Bay and Hudson Channel. Castro, the island’s capital, is only a half-hour drive away from the lodge, as is the airport which offers a daily flight to Santiago. The city of Puerto Montt, which has more frequent flights to Santiago, is about three hours away, including a short ferry ride.